Fifty years ago, Dr. Martin Luther King, Jr. addressed a nation with his “I Have a Dream” speech. As you know, our family is living that dream. Our dad (Pop Pop) was there for the March on Washington–he and his Dad rode a bus from Harlem to D.C. We asked him some questions about the day, and are so glad to be able to hear his recollection of this moment in our history. He was 24 years old at the time. Why did you and your dad decide to go? Were you going to listen to Dr. King, or take in the whole “March on Washington for Freedom and Jobs” experience? What prompted you and your Dad to join those who traveled to DC for this? Part of the reason we went was for our descendants, so to have you ask about the March makes it worth it to have gone that day [and be able to share it with you]. To be able to look back and say, “Great-Great Grandpa was there” and ask questions, to let the significance live on in our family. That’s important. Martin Luther King wasn’t the big name, it was about equal rights. I went back and forth and back and forth on whether or not I was going to go (due to perceived threats of violence). Late in the decision, my Dad decided to go…and then we had to find a way to get there. The National Maritime Union was taking buses. We left late in the night and rode to Washington and got in around dawn. Were you afraid of any violence? Not when I was there. When I was deciding to go, I hesitated, thinking “it may be a mess”. But when I was there? It was very calm, and I don’t even think there was a large police presence to alarm you. Were there a lot of white people there with you? There was a good mixture of whites in the crowd, a fair number of whites in the civil rights movement. This was the day to be there, the place to be. How did it feel to be one man among many standing there along the pool, waiting to listen to the speech? This is Dr. King’s speech, but our story. How did you feel when Dr. King spoke those historical words, “I have a dream”? Dad said he was about a third of the way back on the left side of the Pool as you looked toward the Lincoln monument, so he was able to hear and see the events. and of course, the “I have a dream” theme was very dramatic. It was rousing, it really moved the crowd. It made the hot day worth it as we stood along the reflecting pool with no trees and no shade. The importance of so many people coming to Washington and saying silently (other than the speakers) that they wanted equal rights was exciting. It made it seem entirely feasible, and it was a great crowd. It achieved its purpose and negated the naysayers who were fear mongers, saying there would be rioting in the streets. It was a great day. What else should we, your children & grandchildren, know about your experience? There’s a historic context to that day and to that experience that it’s important for my descendants to know that I was there. It draws their attention to where it was and why they were there…a great day in our country. It’s important that some of us remember it, what it was about, the aim, the goal. Following our questions, Greg and Dad talked about the impact of the March on our lives today, on having the first Black President. This March made strides to get us to where we are today. Thank you, Dad, for sharing your story, this legacy, with us. 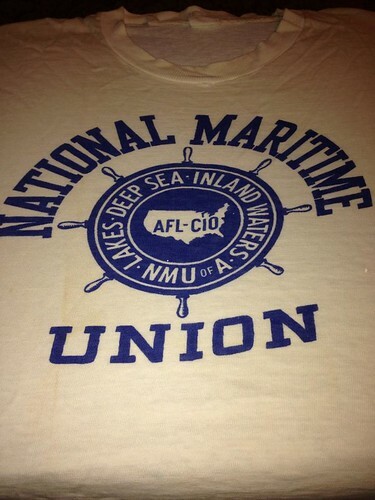 Dad’s only souvenir from the March on Washington–a shirt from the Union he rode with on the bus to D.C. This entry was posted in About Us, Memories, Our Extended Family and tagged "I Have a Dream", Dad Willis, memories. Bookmark the permalink.